Our first structure is really going up! Here are some photos. 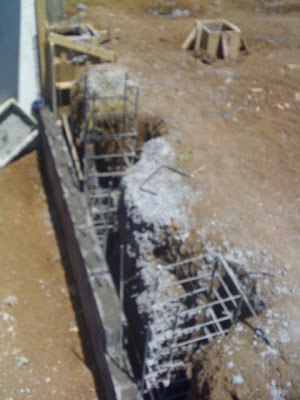 This is a view of our footing excavations and rebar up against a retaining wall. This retaining wall was required of our new neighbor because they are constructing a building (house?) down in an excavation, substantially lower than our natural land contour. When they dug out their lot, they exposed our planned back bedroom wall to undermining if the land ever got washed away from our property, down into their "basement" level. 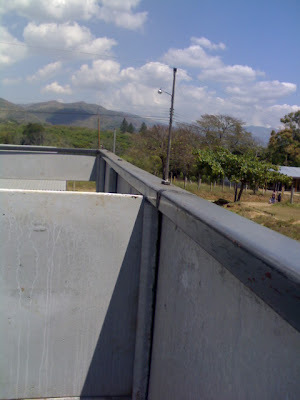 Below is a typical footing pier with the wall post bolted into place, on top of it. Notice on the nearest post, there is a slot facing the lower right corner of the photo, but no slot facing the lower left corner. 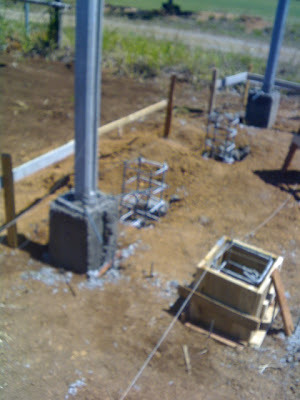 Therefore, this is a corner post where a wall is coming across from the distant post and then turning to mate up with the not-yet-existing post to the right. 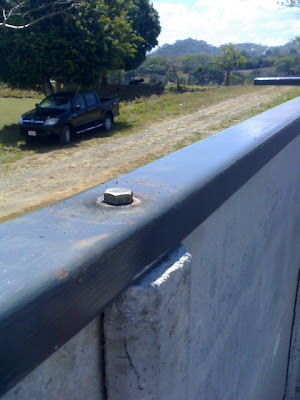 This is the steel cap running along the top of two wall panels, bolted into one of the posts. The house is all steel and concrete. No wood for the termites! (Except for the internal ceilings and some minor indoor features.) You can see our little farm road / driveway. This view is looking south, from north of Atenas. That is the town hidden in the trees in the distant hills. To the left is our neighboring soccer pitch. That giant tree behind the truck is a mango tree. Yum. This view is as if you're standing on a step ladder in the kitchen, looking over the wall into the bedroom. Notice the mountain view out the bedroom window. I don't know if I'll be able to stand it. 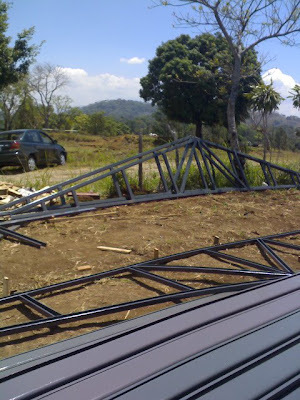 Even the roof trusses are steel. That's all we have for now. Stop back soon. We'll be posting more. And, don't forget to get in your time share reservations to visit [grin].